3 lanes including 9 plus challenges, all positioned over 3 airbags to cushion your landing are waiting for you and your friends to defeat all upper and lower body obstacles we can challenge you with. Ninja Obstacle Course: Get Over Here! 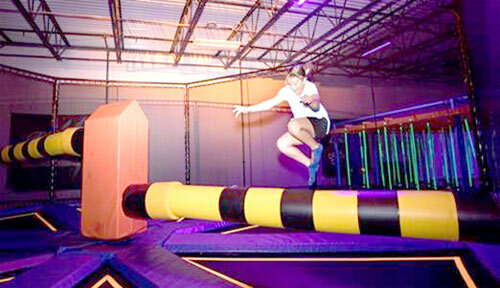 The Ninja Obstacle Course is included in your Open Jump Admission. 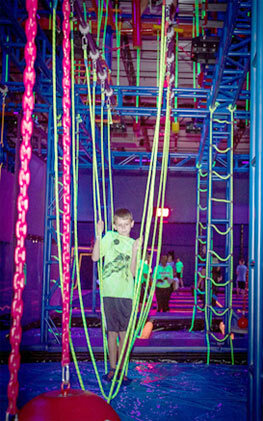 Book your Ninja Obstacle Course party at Xtreme Air today! Wipe Out: Can you survive and not be wiped out? Are you ready for The Wipe Out? Enter the Wipe Out arena and get ready to be nimble. As the Wipe Out Arms come around, you need to jump high or duck low. Can you survive and not be wiped out? Wipe Out: Jump The Big One! 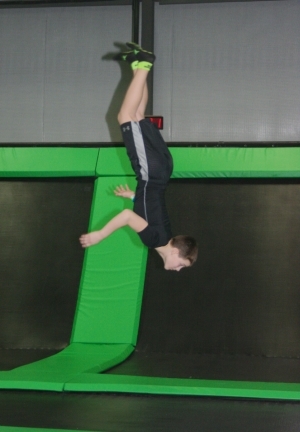 Book your Wipe Out party at Xtreme Air today! All objects accelerate at 9.8m/s2 when in free fall. This acceleration continues until outside forces act upon the object or it reaches terminal velocity. The terminal velocity of a human body is 120mph and requires a fall height of at least 1,500 feet to reach. Many people enjoy free falling as a recreational activity, often using a bungee cord or parachute for safety. A world record for the highest free fall was set in 2014 by Alan Eustace when he fell 135,908 feet from Earth’s stratosphere. People will flock from the far corners of Wisconsin. Oshkosh’s EAA AirVenture, annually attended by worldwide aeronautics fans, will probably be cancelled as you become the new sky diving attraction. 12 foot and 18 foot jump towers will scare the daylights out of you. You didn’t even know you had daylights in you. You didn’t need them anyways. Book your indoor free fall ride at Xtreme Air Trampoline Park for adrenaline packed fun. Shake, rattle, and roll your way across our Fidget Ladder – a ladder made mostly of ropes that has a mind of its own! It is the ultimate ninja skill test of balance, as climbers cling to the ropes while trying to control which way the ladder will twist. 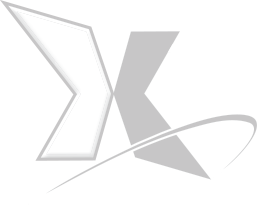 Challenge your body, core, and your own strength with the Fidget Ladder – another active way to have fun at Xtreme Air in Appleton! Ready to take it up a notch? Pretend you’re a tightrope walker and walk across the Fidget Ladder to the other side. Daring? Yes. Downright crazy?! You betcha! 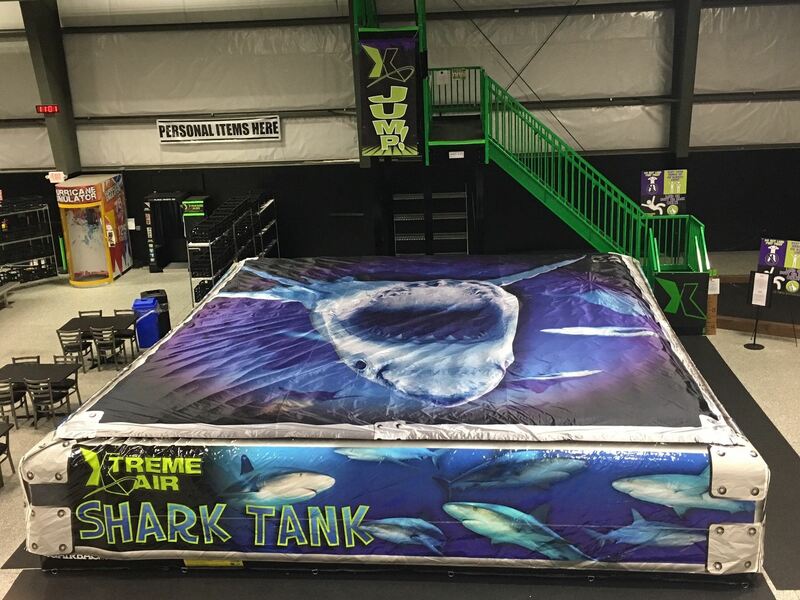 Buy tickets to take the ultimate ninja test at Xtreme Air Trampoline Park, the best family entertainment venue in the Green Bay, Appleton and Oshkosh areas. Climbing rocks, boulders and other natural features dates back to the origins of humanity. Climbing techniques and gear have changed with the passing of time, and many modern climbers now wear helmets, specialized shoes and gloves. 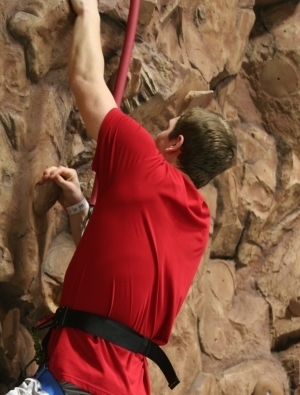 Indoor rock walls have been created to help beginners learn to climb and let advanced rock climbers practice their skills and techniques. Long, difficult climbs are often a test of an individual’s climbing skill and physical endurance. 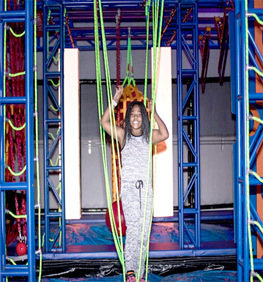 Xtreme Air’s three story indoor rock wall is the perfect place to test your skills. Whether you’re a total climbing beginner or a seasoned climber looking to practice, Mt Xtreme has the experience you’re looking for. Go as high or low as you want in as easy or difficult a climb as you need. Book your Mt. Xtreme indoor rock wall climbing party at Xtreme Air for a rocking good time! The rules of dodgeball vary by geography and tradition. These traditions are typically borne of familial legacies and gym teacher monarchies influencing popular regulations. Objectives typically include some variations of hurling a spherical ball towards opponents or teams of opponents in efforts to remove them from the game. Adult or child players attempt to avoid or dodge the balls, thus giving the sport its name. The game is won by eliminating all members of the opposing team. If a ball is caught in the air, even after striking a player, the player who threw the ball is out. Some rules allow players to block incoming balls with a ball they are currently holding, a temporary strategic advantage circumstantially mitigated by the reduction in opportunities to eliminate opposing players. Balls are generally made of foam or rubber. Trampoline Dodgeball – Yes, Yes and Yes. Come and join the fun in our 2 Dodgeball Arenas! Your best friend turned arch-rival is flailing in the air unable to adjust as you pelt them with a satisfying thud. The rest of your dodgeball enemies will soon fall victim to your barrage of foamy doom from the sky. None of them are a match for the precision and strategy of your air assault. One by one they will fall, begging for mercy - their champion. Appleton, Oshkosh and even Green Bay will come to revere you as their greatest athlete. This is exactly how it will happen. Schedule the ultimate trampoline dodgeball game at Xtreme Air and dominate your friends and family. Slacklining, although it shares some characteristics with tightrope walking and zip-lining, is actually a different activity. Unlike tightropes, slacklines are flat pieces of polyester or nylon webbing and are not held rigid. Instead, slacklines are like long, narrow trampolines stretched between two poles. Slacklining was invented by rock climbers in 1979 but has since become a common recreational activity outside the climbing community. Some individuals use slacklining as a non-traditional core workout. Slackliners unite! Our indoor slackline gym, the X-balance, lets you work on your tricks and improving your form. Do handstands, jumps, 360s and start an Olympic sport. Do it for the health benefits or do it to experience something different – JUST DO IT. Even falling is a great time. 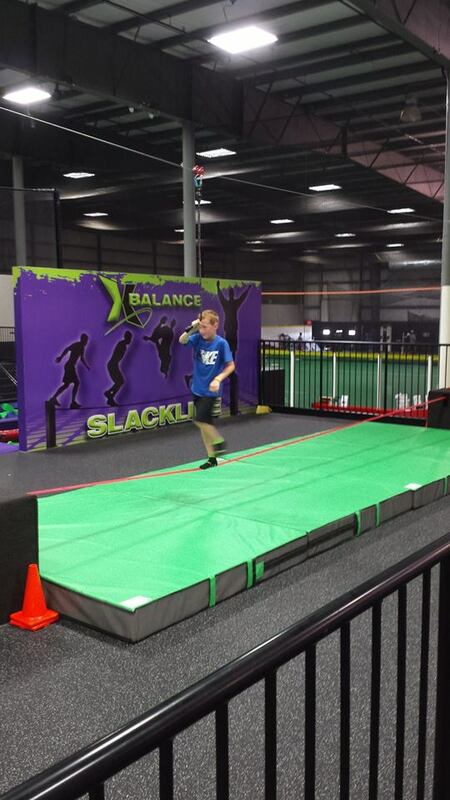 Book time at Appleton’s indoor X-Balance slackline gym, Xtreme Air, for some fun tricks or a great workout. Invented in 1891, basketball is a team sport traditionally played in a 5 vs. 5 match. Players on each team attempt to put a ball through a hoop to score points in multiples of 2. Successful shots from beyond a line of variable distance from the hoop (depending on rules and regulations) are worth 3 points. Since the regulation hoop is ten feet above the court, dunking is a near impossible feat for people without impressive vertical leaps. Basketball leagues often organize teams based on age group, so kids play with other children and adults are paired with other adults. When you want the vertical game of LeBron James but have the athleticism of Kevin James, Xtreme Air will send you into the stratosphere. Dunk on your dad, dunk on your kids, and dunk on your friends. Feel that? It’s called CRUSHING IT. Nowhere else in Appleton, Oshkosh or Green Bay can you put on a display worthy of taking your talents to Cleveland. 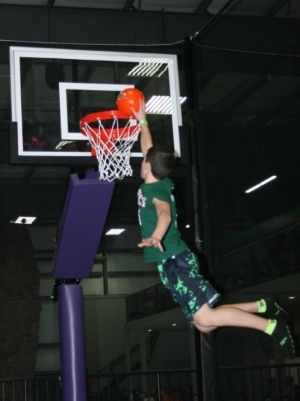 Book a trampoline slam dunk contest at Xtreme Air and get ready to show off your high flying trampoline moves! Modern trampolines were invented in 1936 using canvas and springs. Their name is a derivation of the Spanish word for “diving board.” Allowing individuals to jump significantly higher than normal, trampolines are used for exercise, recreation and competitive purposes. Trampolining is an Olympic Sport children and adults have historically enjoyed watching at the Summer Games. Their use in aerobics and other exercise activity often takes the form of a one-time or out of the ordinary routine to provide a variety athletes cannot find in the gym. Trampoline Parks – Explosive Fun! Jump on our trampolines. Then jump again. And again. Now try not to smile. 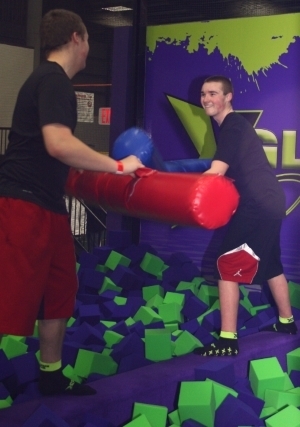 You’re smiling because you can’t stop smiling when you’re at Xtreme Air. Trampolines are freedom from the restrictions of worldly physics. Know who discovered gravity? Who cares? He didn’t have a trampoline. Hop, flip and free-style your heart out. With our forever-long super-bounce trampolines, you’ll touch the Appleton skyline. Quit experiencing the Fox Cities from the ground and get up here where the stars live. 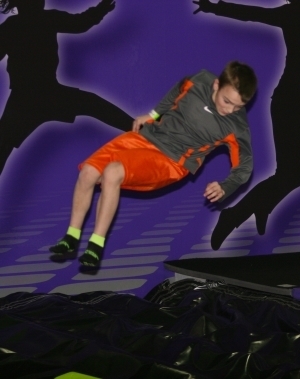 Book time or set up a party at Appleton’s indoor trampoline park, Xtreme Air, and get ready for flying fun! Note: Children 3 and under are not allowed during normal open jump hours. Special Tot Time is available. Air Bags Cushions: Safe athletic training applications. Air bags are inflatable devices used to cushion impacts. Commonly found in cars since the 1970s, air filled bladders have been used for many purposes since. Examples of their use include Hollywood stunts, extreme sport training and fall protection for construction and other workers. Large air cushions have also seen use recreationally, allowing individuals to leap from high altitudes without fear of injury. 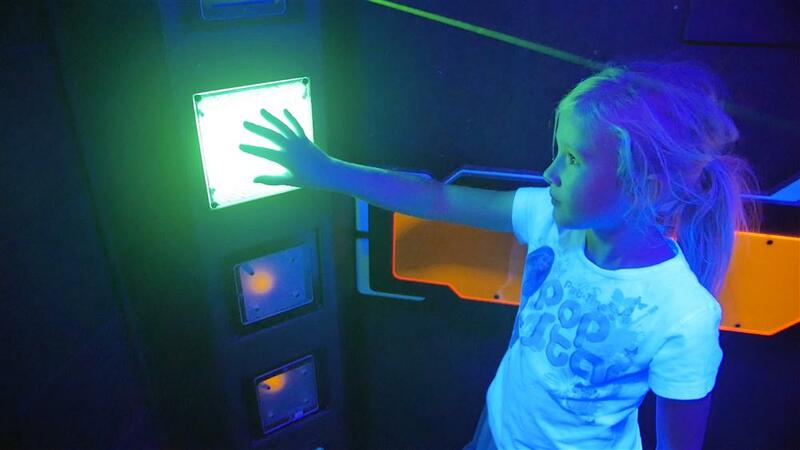 Air bags are becoming a standard replacement for foam and ball pits owing to their safer and more hygienic nature. Air Bag – Don’t Care Bag! The thrill of falling without a parachute makes you feel invincible. 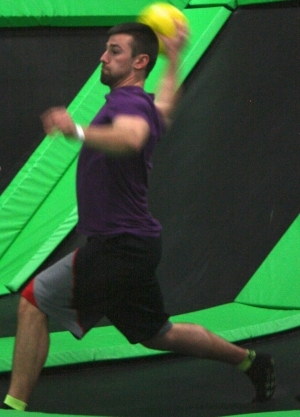 After experiencing a trampoline or platform based airbag landing you’ll feel taller, smarter, faster and stronger. With more confidence and a brighter smile the world WILL be yours for the taking. Buy tickets to jump like a Hollywood stuntman into a giant air bag at Xtreme Air Trampoline Park, the best family entertainment venue in the Green Bay, Appleton and Oshkosh areas. Gladiatorial jousting is a game involving two players on pedestals. Each player is given a pugil stick and must stay on their platform. Contenders may employ a variety of techniques including pushing, striking and ramming the opponent with the pugil stick in an attempt to knock them from their pedestal. Players may not drop their stick or grab their opponent’s. Stepping onto the other platform, losing your gladiator stick or seizing the other player results in a loss. Otherwise, the first player to force their opponent off wins. This is the event you’ve been dreaming of. In our gladiator jousting arena, you have one mission: knock your friends off as fast as you can. There is no escape, only victory. Kids and adults have a blast jousting each other. Set up your own tournament and see which of you reigns supreme as the greatest combatant known to man. 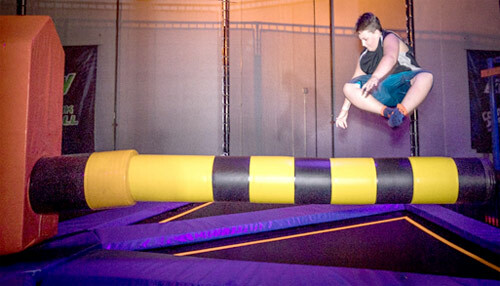 Xtreme Air’s gladiator joust isn’t just something fun to do in Appleton, it’s the best, most exhilarating entertainment in the Fox Cities, Wisconsin, and the known reaches of the universe. Schedule your gladiator jousting tournament at Xtreme Air Trampoline Park and battle your friends like nowhere else. Know what it's like to fly? Yeah, we didn't think so. Soar up to 25 ft. high and feel the wind in your face. It's a pretty view up there. You won't want to come down! The Sling Shot’s wireless hydraulic pump and Flex Pole Technology™ is the hottest new contraption for all-day fun. Strapped in our new Flyer Harness™, you will get BIG AIR while completely safe and secure. Imagine doing a kick, backflip, or your best Bruce Lee impression…in mid-air! 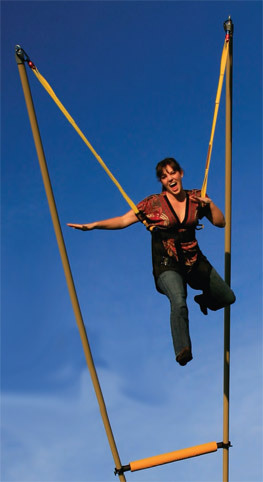 Xtreme Air’s Sling Shot snaps you back and forth like a ragdoll, while you enjoy the uninhibited thrill of flying. It’s a fun experience that will have you coming back again and again. The Sling Shot is completely safe. The only thing you have to worry about is how many friends you’ll brag to at school! 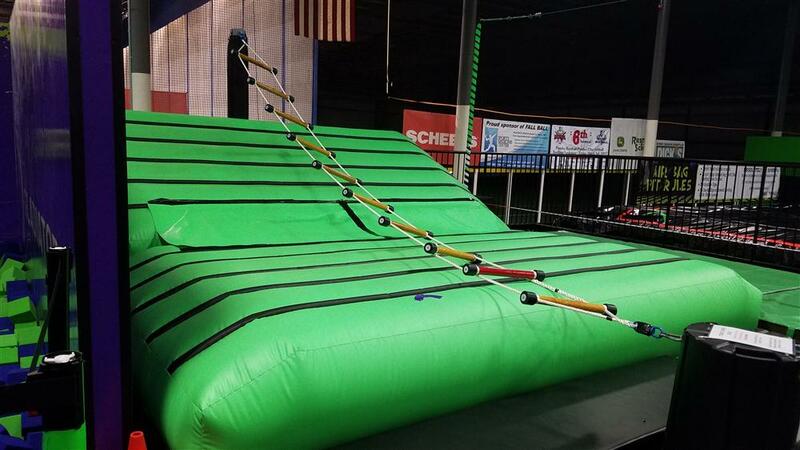 Book your Sling Shot indoor bungee party at Xtreme Air today! Airobics Engages Your Core In Every Move! HAVE A BLAST WHILE YOU WORKOUT! Please see Calendar Tab for upcoming DATES! PLEASE SIGN UP TO RESERVE YOUR SPOT ! Light Amplification by Stimulated Emission of Radiation devices, commonly referred to as lasers, were first theoretically invented in 1917 by Albert Einstein. Lasers are currently used for many things. Disease treatment, metal cutting, communications and scanners are common medical and industrial applications of lasers. Many individuals are familiar with laser pointers, commonly used in presentations. Lasers have also been used as a form of entertainment in laser light shows. 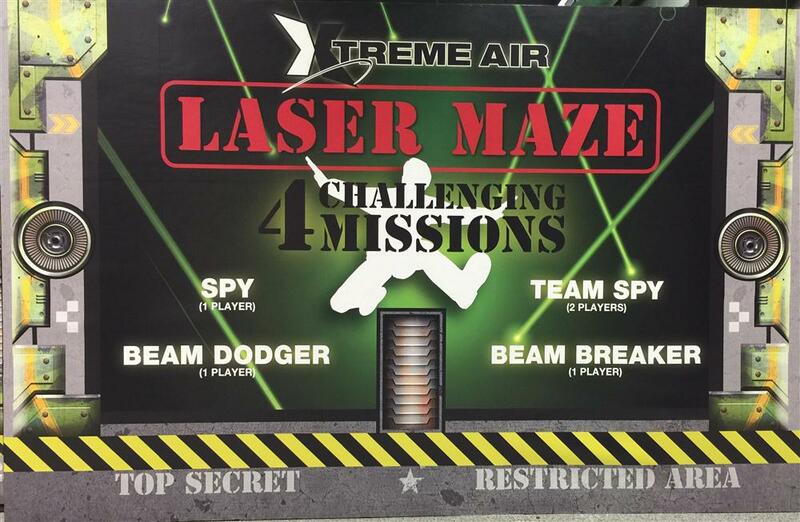 Secret Agent X-Maze: Don’t Touch the Beams! Just like a secret agent infiltrating a supervillain’s hideout, you’ll dodge, duck and jump deadly lasers on your way to the exit. You don’t know when a criminal mastermind will invade the Fox Cities, but it’s gonna happen and you WILL be ready. 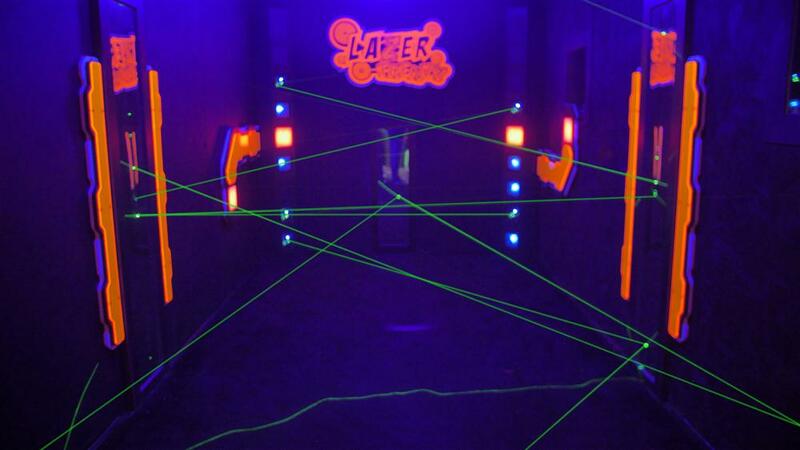 Race your friends to see who’s got the smooth moves to navigate this crazy environment the fastest. Small kids have a height advantage, but full grown adults can compete right alongside them. Appleton’s family friendly entertainment destination.